The early history of The Hudson's Bay Company (HBC) is not well known1, however, an appreciation of the earlier English/French conflicts will bring some insight into what brought about the establishment of the HBC. We cannot go into this conflict to any extent, I have done so at other places. What we learn is that the English in their colonization and trading efforts in North America, quite literally ran up against a western brick wall, one located just beyond the Appalachian range. This was a French wall, manned by the French and their native allies. The southern flank was covered; the northern flank, was not. It was this northern flank that made the French vulnerable. English traders had long since found a way to the far northwestern lands of North America; it was by way of the Hudson Bay. They knew this since the days of Henry Hudson. The English not only knew of the easier route, they also understood that at the northern centre of the continent a nation could tap into the riches found there. What they ran into, as they proceeded inland from the western shores of the Hudson Bay, were natives who were ready for a trade and who lived in trackless northern forests filled with the fox, the bear, the beaver, and many other richly-clad denizens of the north. In, went the wanted items, such as: metal tools, tobacco, rum, guns2; Out came pelts of northern animals. What drove the early searches in the north was what drives all searches, is was the burning desire to make a buck, commerce. These northern searches were carried out in an attempt to satisfy the thirst the gentry had for furs. 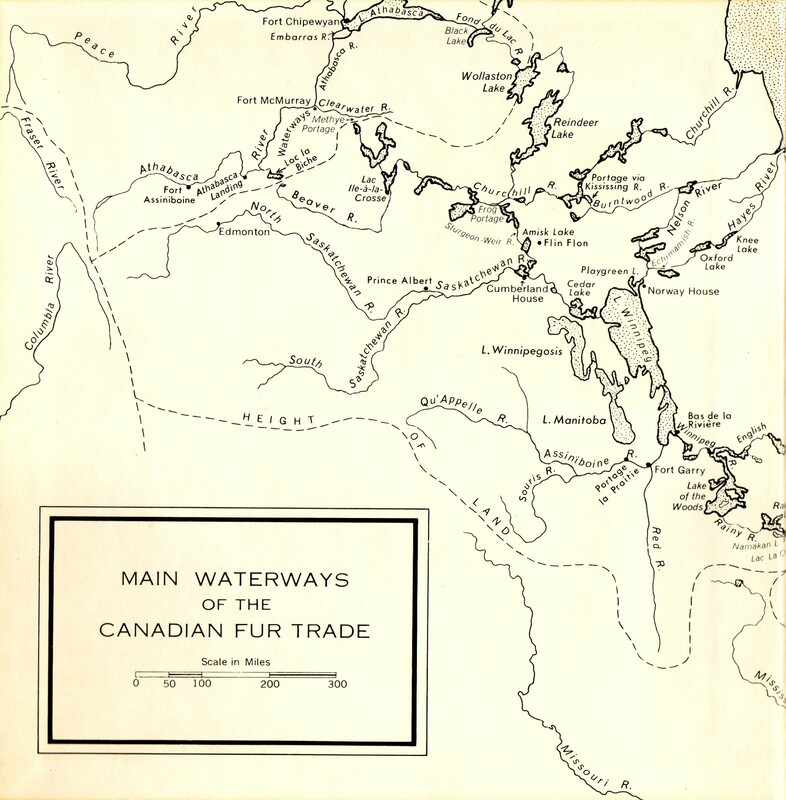 The development of the northern fur market was an evolving thing, as with any market, a slow and systematic build-up on both the supply and demand sides. The fur market, like all commercial markets, however, was to be satisfied by private enterprise.3 However, the far northern searches by sailing vessels were made to suit another end: to satisfy the thirst Europeans had for the wondrous commodities to be found in the orient. It was thought that a much shorter route to the far-east could be had by going over the top of the North American continent; if only one could be found. This search for the North West Passage was carried out mostly by government expeditions, including, in later years, that of John Franklin. In 1656, two Frenchmen, Radisson and Groseilliers, arrived at Quebec with fifty canoes laden with pelts. They had travelled many months to and from the territory beyond that of Lake Michigan, the Wisconson country. Such men as Radisson and Groseilliers continued through to 1660 to arrive at Montreal with large flotillas of canoes "so great a number of boats that did almost cover the whole River." This business the French Governor sought to tax and it was soon thought by those who laboured in the business to shift their business elsewhere. It is with these voyages of Radisson and Groseilliers that one might trace out the beginnings of the HBC. With the conclusion of The Seven Years War, in 1763, the field opened up for HBC, one free of foreign competition; but, not, as it happened, free from competition from fellow British subjects. A few hard-headed and far sighted Scotsmen at Montreal decided to cut themselves in. They were masters at getting financial support; and, as far as employees go - there were, because of French territorial loss, experience voyageurs, or coureurs de bois ready to go to work. Thus was formed the North-West Company, or, as sometimes known, the Canada Company. Members of the two companies (Hudson's Bay and North-West) fought bloody battles in the wilderness.13 By 1816 matters came to such a head that the British government stepped in. And thus the feuding parties, in 1821, were merged into one by an Act of Parliament to be officially known as The Adventurers of England trading into Hudson Bay. There are yet significant events to which I must refer, before concluding. The merging of the two companies, in 1821, by government fiat, allowed for a continuing monopoly which extended from Rupert's Land to the Pacific coast, an arrangement which was renewed in 1838. Thus the Company had government control on everything in the North West Territories and beyond to the Pacific Coast. Then, in 1838, an event happened which shaped the current day State of Alaska. In respect to securing the furs of North America: the Russians were not asleep; they made inroads from the west. Apparently they had their own company, Russian-America Company. An agreement was worked out whereby the Russians recognized the HBC posts and in return it agreed to supply the Russian posts. Apparently, too, a boundary was worked out which eventually became the eastern border of the Alaskan State. It is, of course, necessary, in this short sketch on HBC to make reference to George Simpson. Simpson became the Canadian governor of the HBC. For years he worked for the company in every capacity one might imagine. His experience in traveling through the then wilderness encompassing western Canada; no one knew these wilderness areas any better. During his years, 1820-60, as the Canadian governor, the HBC was at its greatest peak of power and profitability. 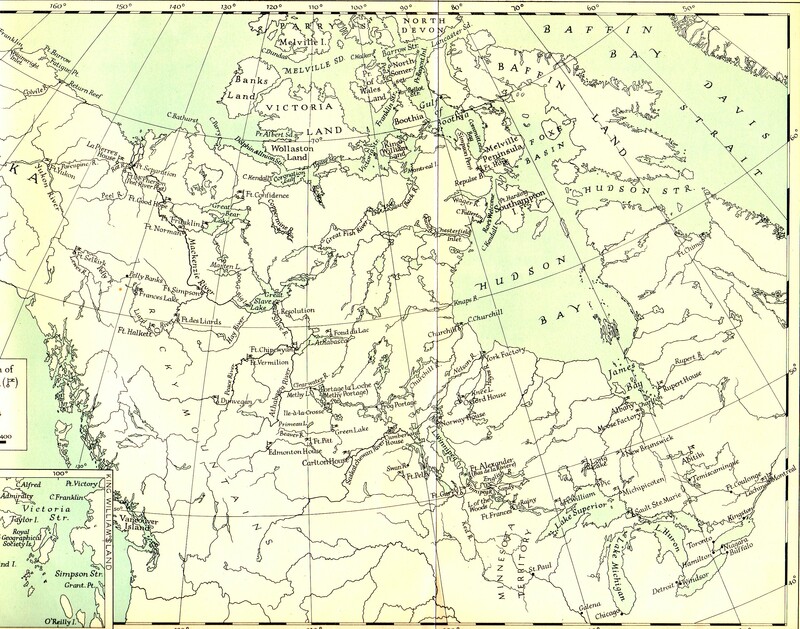 The territory, over which it exercise its power, government-like, covered the whole of Western Canada, indeed parts of the north-western States as they exist today. 2 "From England they [HBC] sent annually three or four ships laden with coarse woolen goods, guns, powder and shot, spirits, edge-tools, and various other utensils, in return for which the natives sell them all kinds of furs or peltry, goose-quills, castorum, whale-fins, and oil, bed-feathers, etc ..." (Cawston, The Early Chartered Companies (1296-1858), pp. 161.) Castorum, incidentally, was defined in a footnote: "The mucilaginous substance found in two inguinal sacs of the caster (beaver), of pungent smell and acrid taste, formerly much used in the European Pharmacopoeia." 3 What I have come to realise, as my study of history continues, is that the the exploration of the North American continent was carried out by private interests with a view to profits. European countries such as England and France did not send out "Government Explorers." Their involvement, in time, was to attempt to regulate matters. People, or companies, who wanted to set-off exploring in foreign parts of the world might seek their particular approval, an approval which was usually given for a cut of the profits. 4 Brebner, p. 229. The early Canadian routes beginning at Montreal, while it involved a very long trip by paddling canoes to the reaches of the far Canadian north, the old Rainy Lake Route continued to be used. 5 Brebner, p. 235. The Dutch, as Brebner points out, were also trying to entice Radisson and Groseilliers into their service; knowledge in those days, as it is these days, was a marketable commodity in itself. 7 Cawston, The Early Chartered Companies (1296-1858), pp. 157 & 164-5. 8 It was named after Prince Rupert of the Rhine, a nephew of Charles I and the first Governor of the HBC. 9 I touch on certain aspects of The War of the Spanish Succession in my work on Acadia. 10 Cawston, The Early Chartered Companies (1296-1858), p. 177. 13 The people the North-West Company, because of the colour its officer's uniforms: were known as the "Grays"; HBC, the "Blues."